April 11. We are off to Botswana this morning, after our brief stop in Johannesburg overnight. Once we leave Joburg, we’ll have no WiFi for about nine days. But, not to worry, I’ll be keeping the blog and will post it a day at a time, once we return to civilization. Consider the nine days your blog-reading vacation. You’ve earned it. Now, we don’t want you to think we are taking just any old trip. The first six days in Botswana will be spent on a mobile tented Safari. In taking this safari, we will be following precisely in the footsteps of Prince Harry and Meghan Markle, as you can see from this excerpt from a Vanity Fair Article last month. 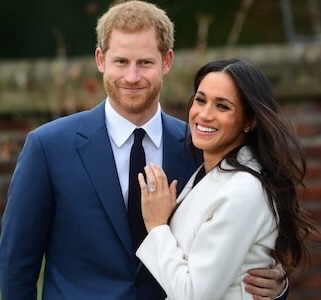 This particular trip [to Botswana] was a special, surprise birthday getaway for Markle, as well as a first anniversary trip [for Harry and Meghan]. Harry [Diana’s son] had booked a £650-a-night tented suite with a carved wooden king-size bed and open-air shower. They slept under the stars and enjoyed their meals al fresco. From their veranda they could see zebra cooling themselves in the nearby watering hole and other wild animals at close quarters. It was the romantic getaway Harry had hoped it would be and according to a report in the Mail on Sunday, the couple spent an afternoon enjoying lunch before walking hand in hand to a prime spot overlooking the river, where they watched pied kingfishers swooping over the water and tried to spot the spectacular African fish eagle. Africa has always been a favorite spot for the younger of Princess Diana’s sons. He mentioned in an interview with Hello! magazine in January 2017 that he had first visited the country after his mom died in 1997. Ever since then, it has been a place of solace for him. We’re planning to talk to Roger about our getting an invitation to Harry and Meghan’s May 19 wedding for Carol, Phoebe and me. Besides the Botswana tent safari connection, Meghan, Carol and I (and our daughter, Jodi) share our Northwestern University degrees (though we were not classmates), so I’m thinking this should be a done deal. Watch the blog in May for details and photos from Windsor Castle. Formerly known as Bechuanaland, a British protectorate, Botswana gained independence in September 1966. The country is divided into 9 districts, with its largest towns being: Gaborone, Francistown, Selibi-Phikwe and Lobatse. Its dominant economic activity is diamond mining, followed by tourism and manufacturing, with agriculture also playing a significant role. It is predominantly flat, dominated by the Kalahari Desert which covers up to 70% of its land surface. It’s Capital is Gaborone. 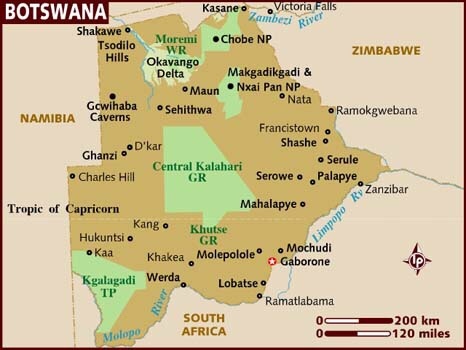 Botswana is a landlocked country, bordered by Namibia (west & north); South Africa (south); Zimbabwe and Zambia (east). The climate is dry, semi-arid (rainfall is unpredictable and droughts occur often) with warm winters and hot summers with humidity raising summer temperatures into the 40’s (Celsius; 100 ̊F). Summer: Sep – April / Winter: May – Jul. During summer, short thunderstorms are frequent, hot days and nights with a cooling off after rain spells. During winter, the days are dry and warm, with night time temperatures dropping with cool to cold nights and early mornings. Ethnically, the country is 79% Tswana ( oe Setswana), Setswana is the principal language and 72% of the country is Christian. Botswana is the world’s largest producer of diamonds and is twice the size of the United Kingdom – yet only has a population of only about two million people. Since independence in 1967, it has had one of the fastest growth rates in per capita income in the world. The miraculous Okavango Delta (250,000 hectares), fed by crystal pure waters from the Angolan Highlands, floods once a year, spreading fingers of water through a desert wonderland, resulting in teeming herds of game and unique water and land based game viewing opportunities. The Okavango Delta is relatively new in geological terms—only a meagre 60 000 years old. Before the formation of the delta, for some two million years, the Okavango River flowed right through Botswana and drained into a massive lake somewhere in the region of the Makgadikgadi pans in Botswana. Rivers are hard-coded to flow towards big bodies of water like lakes and seas. But then about 50 000 years ago, there was a massive earthquake in Southern Africa. The land near today’s border between Botswana and Namibia shifted, interrupting the Okavango River’s usual, obedient flow. It was a shock to the river’s system. The water had no choice. 11 trillion litres spilled out into the desert like oil in a pan, flooding a vast area with a steady torrent of fresh H2O. One awkward geological twist of fate had created the greatest natural oasis on earth—the Okavango Delta. Today, the Okavango remains as wild as it was when it formed. The inundated area of the Okavango Delta fluctuates between 6,000 to 8,000 square kilometres every year, swelling to up to 15,000 during the flood. The swamps and floodplains have kept human development at bay, and the wildlife remains a wild as it was 10,000 years ago. More than 150,000 islands now dot the Delta, varying in size from several metres to larger than a big city. Chiefs Island in the centre of the delta is the largest island; it’s like a great big time capsule, a snapshot of the Africa of old, with great herds of elephant lumbering across the plains and super prides of lions stalking the night. There is no spectacle like the Okavango Delta in flood, when rains from Angola’s western highlands filter over nine months to the Delta, transforming it into a unique system of waterways that support a vast array of plant, animal and birdlife. Safari activities by water are the primary speciality of the Okavango and gliding through the waterways by mokoro, a flat bottomed boat, poled by a local guide makes the Okavango experience unique in the world. This region boasts large animal numbers especially in the flood months, which range from May to October. Most commonly seen are elephant, hippo and crocodiles as well as unique game such as red lechwe and sitatunga. Lion, wild dogs, buffalo, hyaena and cheetah are also often seen as well as prolific birdlife, including king-fishers, cranes and fish eagles. In the Moremi, certain areas are particularly renowned for certain types of game, including Xakanaxa Lagoon (wild dog, cheetah and a very high density of antelope) and Khwai River (vast herds of elephant and predators). So we hope you won’t miss the blog too much these next nine days. We promise some pretty great adventures when we return.